On Tuesday evening this week, I pushed back my chair and closed my laptop with a sigh after putting the first two thousand words of the cookbook down on virtual paper. I was ravenous; there is something about transferring a small part of yourself into writing that leaves one feeling mentally drained. Satisfied, but peculiarly empty. I thought of the quickest snack possible and tipped a quarter cup of popcorn kernels into a paper sandwich bag. I slid it into the microwave and exactly two minutes later was wolfing down popcorn. A sprinkling of Parmesan cheese and a drizzle of melted butter was all I needed to transform it into a gourmet treat. With a glass of apple cider and my popcorn, I tiptoed upstairs, past the rooms housing three sleeping children, and to our loft, where Danny was still awake. Through mouthfuls of popcorn, I offered every cliche I could think of related to beginning. I’m out of the gate. I’m off and away. I’ve set sail. Danny didn’t seem quite as struck as I was with the magnitude of my commencement, but he hadn’t witnessed my internal sluggishness leading up to this point. I have been busy, ohmyyes, but busy with everything except writing a cookbook. The pantry has had a rigorous clean out and restocking. My kitchen stove has been deemed slightly above useless and a replacement has been researched. I’ve taken a roll call of the pots, pans and casseroles in my kitchen and made a list of missing members. A kitchen timer has been procured, as well as two thermometers – meat and candy. One must be precise when recipe testing for a cookbook. I’ve even ordered a quilted table runner from New Zealand, for goodness sake, although that -maybe, just maybe- was a random Etsy impulse buy. It’s as though I’ve been nesting – only this baby is words, photos and recipes. In retrospect, I see now that it all had to be done (except for the table runner, perhaps) before I could start the book in earnest. Like decluttering an old work desk before sitting down to compose a new piece of writing, I’ve been organizing both my thoughts and my kitchen. Here’s hoping the gears are sufficiently oiled and all the moving parts will function as a whole as I embark on this project. For now, I offer a bowl of popcorn, easily made, free of preservatives, and popped in your microwave. Sufficient to say, we never buy boxed microwave popcorn, with its ‘butter’ and ‘extra butter’ artificial flavor. Once in a while, if I’m making a big batch, I’ll pop it kettle corn style with a heavy pot and a lid. But for smaller batches of popcorn with about a five-cup yield, a paper bag and two minutes in the microwave works just fine. Every major grocery store carries brown paper lunch bags (usually in the aisle with the household cleaning products). These, along with popcorn kernels (I buy organic, from a health food store) are all you need to pop your own evening snack. 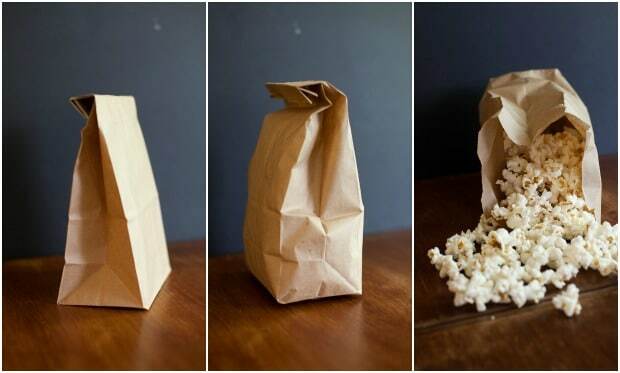 A paper lunch bag and a handful of kernels is all you need for a quick, unprocessed popcorn snack at home. Pour corn kernels in the paper bag and add a few drops of oil. Fold the top over three times and place the bag in the microwave. Microwave on High for two minutes. Remove bag and open it carefully. Enjoy. Microwaves vary in strength. Stay close to your microwave and stop the cooking if you hear the popping has slowed or stopped. How do you decompress at the end of a day? This is so convient! Normally we use a popcorn popper on the stove, but we are on vacation and this microwave method is perfect! What range did you choose? I’ve been researching as well. Also, am always on the lookout for great linens…what is your Etsy site? We haven’t decided on a range yet, Paula, but we like what Kitchen Aid has to offer. I don’t think I said it yet but congrats on the cookbook! And as I’ve said with my students at school writing is hard work. It takes a crazy amount of mental capacity and space. Sometimes you need to do all those other things to create the space to be able to write. So congrats on those first 2000 words! Look forward to having your book! Also, I learned that you can put a staple in the brown paper bag with no adverse “metal” effects in the microwave. I’ve heard that, but I’ve always been wary. Plus, it works well with just a fold! I’d also hate to have a staple disappear into my bowl of popcorn. Yikes! Do you have large amounts of unpopped kernels? I have done this before, but without the oil, and wasn’t happy with the quantity of wasted kernels. Maybe the oil helps. As long as I keep the amount under 1/4 cup, almost everything gets popped. If I try 1/3 of a cup or more, it doesn’t work as well and some spots burn with other kernels just don’t pop. I’ve been thinking that we need to start making our own popcorn since it’s one of the last few processed foods we still buy, but I’ve been a little nervous about doing it on the stovetop…don’t ask me why! This will be perfect for the afternoon movie dates I’ve been having with the kids when it’s too hot to go outside! 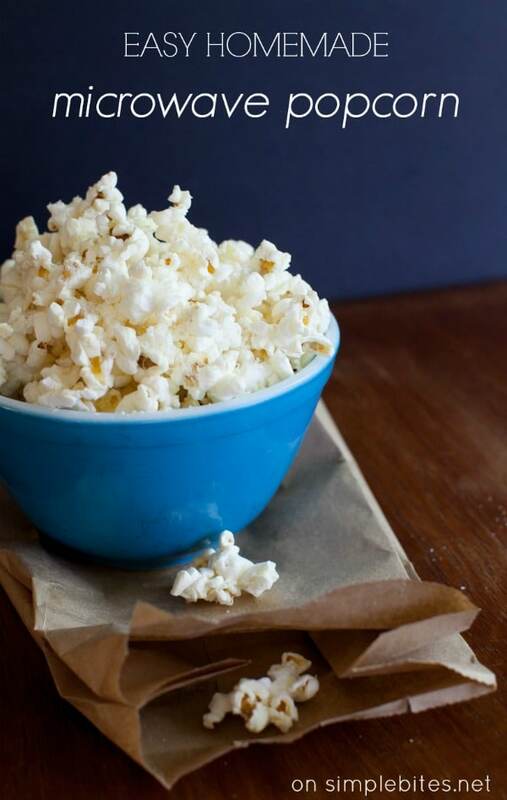 Homemade brown bag microwave popcorn is so easy and you can even skip the oil! I’m so glad I’m not the only one who’s been doing some crazy kitchen/pantry/product organizing! And while I’m not on the hunt for a new stove, I did purchase an oven thermometer just to ensure accuracy. This is great! My dad used to make popcorn this way and I had forgotten all about it. LOVE making popcorn like this! Great tutorial!! Homemade popcorn is the only way to go! I do this too….soooo easy, healthy & delish! Aimee – I’m interested in instructions for the kettle style popcorn. I LOVE getting it at state fairs but would love to be able to do it at home!! Ok, I just tried it. The popping hadn’t slowed, but half of it burned anyways. Any ideas? Alysa, our microwave is pretty old, so maybe you have to adjust the time? Maybe 1 minute and 45 seconds? Sorry it burned, but it’s normal the first time until you find the ‘sweet spot’. Love this popcorn popping method. It’s healthier and far less expensive than the boxed versions. Hi. Just thought I’d write you a quick wee comment.. what caught my eye and ‘told’ me to write to you was that you’ve bought a table runner from little old NZ… That’s where I am!! I’ve been following your blog for a while and your pinterest posts too!! 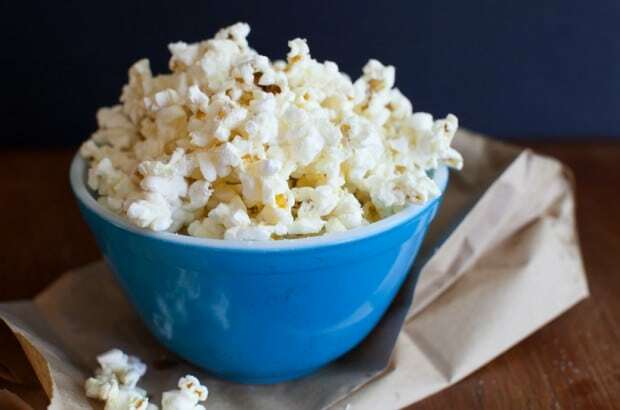 Thanks for the natural popcorn idea – we used to have a popcorn maker that was sooooo temperamental and between that and burnt pots! we have succumbed to the easy option of packaged popcorn – which I loath! so i am looking forward to trying your idea. Thanks so much and I hope you enjoy your NZ made product!!!! I totally make popcorn this way at work! So much less scary then that yellow fake stuff 🙂 At home I have an air popper, love that thing, although it sure does make a lot of noise! I make this without oil and it’s still tasty! you have to watch it closely to avoid burning but I think that’s true no matter what you are micro cooking! Your recipe for a quick bowl of popcorn is great. I was having problems with the bag opening before the popping was finished. We have a small “paper stapler without staples” and that solved the problem. I now make one fold and secure the fold with two punches from the stapler – it punches and folds the punched paper secure enough to finish popping. Look forward to the book. That’s an awesome tip! Thanks.